Don't think of Auckland as a city, even though it's New Zealand's largest. Think of it as half urban, half marine - a cosmopolitan experience wrapped up in a fascinating water world and surrounded by over 50 islands. Aucklanders enjoy a warm, humid climate and an outdoor lifestyle. One of the best ways to get out and about is to escape to one of the many islands of the Hauraki Gulf and experience their beautiful scenery. Within 40 minutes by ferry of downtown Auckland, visitors can escape to an island experience - Waiheke, Motuihe, Rangitoto - or journey a little further to Tiritiri Matangi, Kawau or Great Barrier. The Hauraki Gulf experience is complemented by a modern evolving city with restaurants and bars, theatre, art and fashion, a host of new luxury accommodation and a vibrant waterfront. 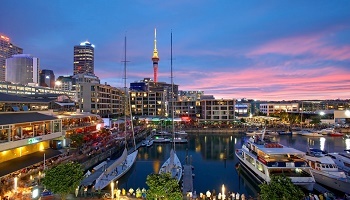 With an infusion of new restaurants and bars, Auckland is a leader in Pacific Rim dining, a style unique to New Zealand - combining fresh seafood and meats with flavors borrowed from Europe, the Mediterranean, Polynesia and Thailand. • Rangitoto Island: visit this 600-year-old dormant volcano and take a road train or hike to the 260-metre-high/852 feet summit for spectacular 360-degree views of the Hauraki Gulf. The Island also has lava caves, unique rock formations and pohutukawa forests for visitors to enjoy. Rangitoto can be enjoyed as a guided tour, or visitors can walk to the top independently. The walk to the summit (one-hour one way) affords an unparalleled view of Hauraki Gulf and Auckland city. • Waiheke Island: Waiheke is renowned for its burgeoning wine industry, unique and exclusive accom-modation and for the many prominent New Zealand artists who have chosen to make this island home. • Self-drive vineyard tours and guided tours enable visitors to sample some of the best wines available on the Island. A visit to at least one local artist should also be on the activity list for the Waiheke Island experience. • Tiritiri Matangi Island: this conservation success story provides visitors with an opportunity to visit a genuine open wildlife sanctuary featuring many species of endangered New Zealand bird life including the kiwi and takahe. Guided tours are available to enjoy this very special island, administered by the Department of Conservation. • Kawau Island: visit stately Mansion House, with links to Sir George Grey (one of New Zealand's first Governors). The Island has walking tracks leading to beaches, Maori pa sites and old mines. Kawau Island is only a short ferry ride from Sandspit - a one-hour drive north of Auckland or from downtown Auckland. 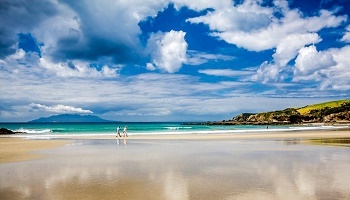 • Great Barrier Island: journey to the furthermost island (from Auckland) in the Hauraki Gulf for unspoiled beaches, native forest and several unique plant and bird species. This island provides spectacular day walks and is also a popular destination for diving, fishing, surfing, bush walking and camping. Daily scheduled flights are also available.